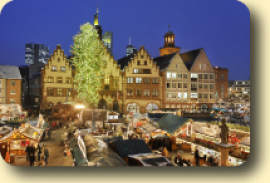 There has been a Christmas market in Frankfurt for over 600 years. Full of history and traditions the Frankfurt Christmas Market is one of Germany’s oldest and most popular Christmas markets in Europe. 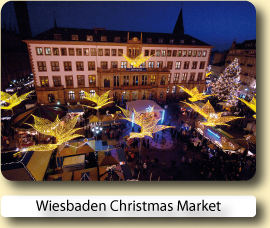 In fact the Frankfurt Christmas Market is so good and beautiful that every year a smaller sibling version takes place in the UK cities of Birmingham, Leeds, Manchester and Edinburgh, which is probably one contributing factor why the German Christmas Markets have grown so much in international popularity, over the last few years. 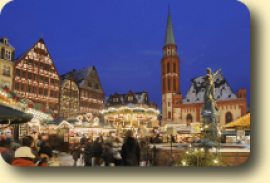 For visitors from outside Germany the Frankfurt Christmas Market couldn’t be easier to get to or have a better location as it is only 15 minutes away from Germany’s largest airport and there's an endless variety of luxury and affordable hotels in Frankfurt to choose from. As soon as you catch your first glimpse of the Frankfurt Christmas Market you will not be able to resist all the beautiful temptations. 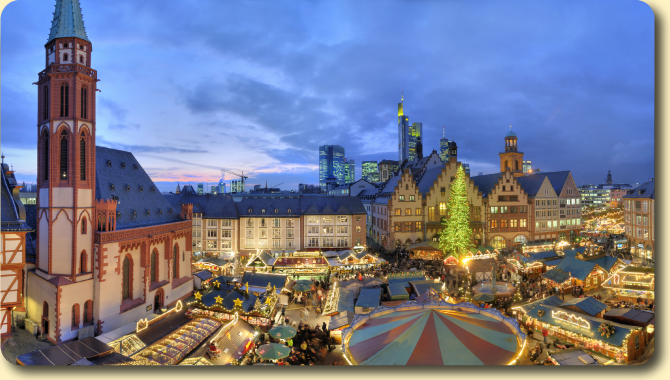 Take a stroll across the market and you will enjoy a wonderful aroma of baked apples, roasted nuts, gingerbread and mulled wine - quite a contrast to the ever-present Frankfurt Skyline in the background! 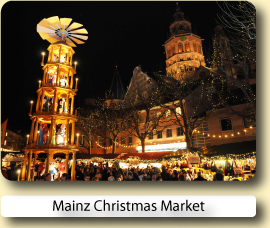 Its scenery of beautifully decorated stalls, the historical backdrop of the Römerberg market place, St Paul’s church and the gigantic Christmas tree all contribute to an unforgetable experience. 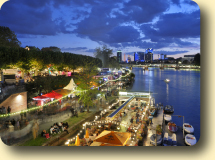 The Frankfurt Christmas Market takes place on the Römerberg square, Paulsplatz and Mainkai quay, 200 stalls offer arts, crafts and seasonal food and drink. A wide range of entertainment around the 30-metre high Christmas tree includes concerts, trumpet fanfares from the balcony of St. Nicholas's Church and the church carillon. You can discover the inside secrets and hidden delights of Frankfurt's Christmas market on a guided themed tour around glühwein, seasonal stories and delicious baked goods. Just ask at the local Frankfurt Tourist Office fordetails. As the seat of the European Central Bank and venue of more than 30 trade fairs per year, the city commands centre stage of the world’s finance and economic markets. 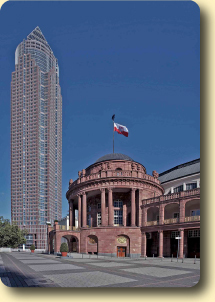 Frankfurt has always played an important role in European history. A number of historical buildings have remained to document this fact: the cathedral, where German kings were once elected, St. Paul’s Church, seat of the first German National Assembly or the Goethe House, birthplace of one of Germany’s favourite sons and poets. Frankfurt truly is the city on the Main. 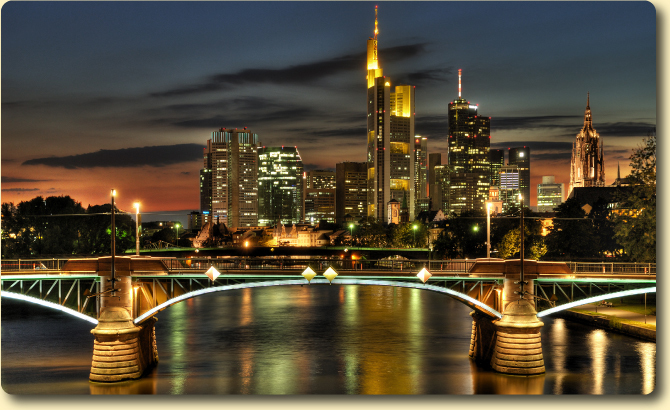 There are rivers in other cities, of course, but few are as dominant as in Frankfurt. The bridges spanning the Main are attractions in themselves, each one different in architecture and character. And choosing on which of the two footbridges to cross the river is almost a question of attitude. Frankfurt's friendliest corner is Sachsenhausen located just across the river Main, her you can experience sightseeing at its best with a tour on the Ebbelwei Express, a colourful historical tram. With plenty of music, pretzels and local cider, the party soon gets into full swing. Here in Sachsenhausen, with its friendly atmosphere, narrow cobbled streets and more than 100 traditional bars serving locally produced cider, you'll quickly make new friends. The people of Frankfurt love nothing more than to sit or stand side by side with visitors in the quaint bars and traditional inns of Sachsenhausen's old quarter and put the world to rights. The spectacular MyZeil shopping centre, designed by Italian star architect Massimiliano Fuksas, opened in 2009, it is a special attraction, and not just for shoppers. The building's funnel-shaped glass facade with its spiralling contours capturesthe eye and the imagination of shoppers and passers-by. Covering eight floors, it has stores selling leading international brands, a delicatessen, a wide choice of restaurants, a major electronics retailer – and Europe's longest free-standing escalator, at 48 metres in length. Great hotel with a charm of its own not some corporate clone. Attention to detail was fantastic both in terms of service and presentation. Very impressed by the kitchenette and separate bedroom, very good value for such a central hotel. Excellent shower. Enjoy unlimited use of Frankfurt's well-developed transport system and reduced admission fees to cultural establishments within the city. Explore the city at leisure with a 1-day bus pass. Hop on and off at 14 must-see stops, including the Opernturm, Palmengarten, Museumsufer, and more. 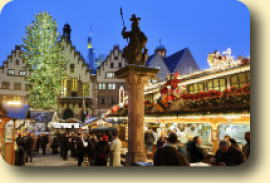 Book your hotel for the Frankfurt Christmas Market with Expedia or Hotels.com.Both online reservation services will let you compare and book hotels at great low prices.